Welcome to MK Limousine! We at MK Limo would like to thank you for stopping by our site for more information regarding our services. Here you will find a brief overview of all the services we bring to the Cypress, Katy, Tomball and Houston area. ​We’re happy to introduce you to MK Limousines Inc, the home of one of the most elite limousine services in all of Cypress, Texas. We are well known for our quality reputation over the years and we’re elated to have you visit us on our webpage today. Let us help you any way we can in order to create the perfect night out on the town! Whether it’s about bringing your newborn infant child home in a “Stork’s Ride Home” scenario to welcome him to the world in luxury, a carpool of individuals with common musical interests on their way to a highly anticipated concert, a couple professing their commitment to one another to the world with a high class wedding, or simply a classy evening for two where you’d like to dine in style, we have your back. We service Cypress, Texas residents who need a ride to conquer their nearest casino, congregations who worship and have fun together on their next Church Trip, tourists or home grown Texans who are looking for some Rodeo action, and even our young residents who want to show up to those Friday Night Lights in complete style. While you’re here, take a look at our Vehicles section when you have a chance, where you can explore our vast fleet selection, with some of the most popular picks in the entire industry. What do you think about a Chevy Suburban LTZ SUV as your vehicle of choice for that next Wine Your? How about picking up all of your daughter’s friends in a Lincoln Town Car Stretch Limousine to take them to the venue of her Sweet 16? How would you feel about a Ford Expedition 14 Passenger Super Stretched SUV limo taking you and your groomsmen to the bachelor party that signifies the last time you’re truly a single man? If that’s not your style, I’m sure that Lincoln MKS Sedan will impress your date as you wine and dine her for a special evening on the town. Regardless of your choice, I can think we can all agree that a Mercedes S550 Sedan would impress any date to any school’s homecoming dance. Let us worry about the logistics of the event. Our arrival and departure times are perpetually perfect. Our telephone receptionists are trained to help those with no prior event planning experience put together eventful itineraries that will be sure to make any night unforgettable. Our drivers are known to be personable, professional, individuals with welcoming personalities. Got a comment, complaint, or suggestion? Speak to one of our owners, who respect every customer’s opinion. After all, where are we without our loyal customers? From the moment we open our vehicle doors and welcome you, to the very second we have you home, we promise to do our best to deliver a professional and satisfactory experience for you and your guests. Have no reservations about choosing MK Limo. We aim to please, and please, we do. So let us please you too! Our services are the cornerstone of our business, and at MK Limo we take the most professional approach to everything we offer. From solitary rides, to group events, you can be sure to find the service you’re looking for in our list of offerings. No matter your Cypress or Houston area event, we have your service needs covered from the first point of pick up, to the final drop off. Airport Shuttles: Thousands of passengers a year head through the airports in Houston and area, and whether travelling into or out of the Cypress area, you can be sure that we will bring you a prompt and timely service that will have you where you need to be right when you need to be there. Whether your own flight or having an inbound visitor picked up, you can rely on MK Limo to be at the right place at the right time. Anniversary: Make this years anniversary stand out with the inclusion of one of our fantastic limousines. From the first point of pick up, your special someone will know that this celebration will be like non previous. Our immaculate limousine service will have you riding in style with one of the most romantic atmospheres a mode of transportation can bring you. Bachelor/Bachelorette: MK Limo brings you the services you need for your bachelor or bachelorette party. Kick off your shoes and toss away the wedding planner for an evening of fun and excitement. 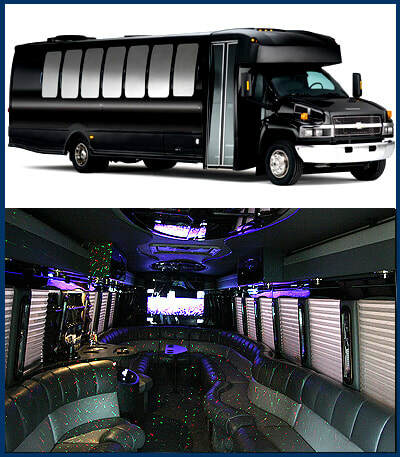 We bring you a wide selection of vehicles to choose from ranging from single or double passenger rides, or full on party busses. Birthday: Your birthday comes around once each year, and finding a new way to celebrate can be a little difficult as each year passes. MK Limo brings you the means to have an all new way to mark your event with our high quality service. Whether you’re having a small gathering or a large bash, you can depend on us to bring you a new and exciting way to celebrate. Casino: Heading to the casino can be a great way to spend an evening, and whether you’re heading to try your luck at the tables, or to attend an event being held there, you can rely on MK Limo to bring you door front service that will have you arriving like a high roller. We bring you an extra layer of memorability as you make your way to the casino floor, and a safe and sober ride home. Concerts: Supporting your local Cypress music scene or heading into one of the arenas in Houston to attend an international draw, you can expect MK Limo to bring you a service that will make your musical venture one to remember. We bring you a service that tends to your every need from the point we first pick you up, until we drop you back off safe and sound at the end of your event. Cruise Shuttle: Heading down to the Gulf of Mexico for a cruise is a great vacation, and ensuring that you have timely and professional transportation will have you starting your vacation right. MK Limo brings you an affordable means to transport groups as small as one and as large as 25 as you make your way to your cruise destination of choice. Corporate Events: Whether a business luncheon or a corporate retreat we bring you a professional service that will perfectly reflect the appearance of yourself and your company. We understand the importance of putting your best foot forward for your Cypress business, and we give you the means to make a truly lasting impression. Graduation: MK Limo is a proud supporter of all of our local schools and students, and we look forward to ushering you into the next stage of your life within or outside of Cypress. You will arrive to your event in style whether alone or with a group of family or friends. Homecoming: Much like your prom, your homecoming is a once in a lifetime event that some look forward to all school year. MK Limo brings you the means to arrive like royalty and leave a lasting impression on your homecoming crowd. No matter the size of your group, you can be sure that MK Limo can accommodate for your Cypress homecoming. Night Out: Cypress and nearby Houston bring you a wide variety of means to celebrate a night out, and when hitting the streets of the city, you can be sure that MK Limo has the means to allow you to do so in the highest class and style. Parties: From house parties to all out gala events, you are sure to find a great time in either Cypress or Houston. No matter the style of party or the number of passengers, you can rely on MK Limo to bring you the service and the vehicle you need to make the most of your evening out on the town. Prom: Your prom can be your first all out gala event, and one that will remain in your memories for years to come, allow MK Limo to bring you the vehicle that will stand up to those memories in terms of beauty, appeal and style. Rodeo: Houston and Cypress are like the majority of cities in Texas, where you can find rodeo events all over on almost every weekend. MK Limo brings you the service you need to descend upon the rodeo in style and class, with all of your friends and family in tow, or for an evening of your own enjoyment. Sweet Sixteen: Allow us to give your young lady the princess treatment with our full service sweet sixteen package. We aim to make the day as memorable as possible as your young girl transitions across this milestone to the land of the young woman. With a safe and secure ride, you can trust your princess to our treatment. Weddings: We bring you a limousine service for your Cypress area wedding that can stand up to the beauty and appeal of your event. We understand the importance of this event, and the work that you put into making sure that it’s perfect, which is why we take the extra steps to ensure that your ride will be as beautiful as expected on this special day. Wine Tours: Though wine may not be the first thing you think of when it comes to Texas, you can find many beautiful vineyards in the area to visit. Whether heading on a virtual tour, or on a wine tasting to get a feel for the worlds offerings, you can rely on MK Limo to bring you a high end and stylish service that gives you your own designated driver. We understand that our services are as good as the vehicles we offer, and when it comes to our fleet, you can be sure that we bring you the best in the business. We bring the highest level of attention to detail to every vehicle that leaves our lot, and you can expect nothing but the best when it comes to our interior and exterior appearance. ​At MK Limo we endeavor to bring you a service steeped in pride, offering you the highest quality services with the most professional approach. Whether for a special date, or a large scale event, we bring you the service you need and the level of professionalism you would come to expect from any local area business in the Cypress and Houston area. For more information regarding any of our services, we invite you to call into our offices at any time during our hours of operations. We have experienced and helpful staff standing by at all times to bring you the information you seek quickly and to guide you towards the perfect vehicle for your needs. At MK Limo we take every step to ensure that you get the best possible customer service while dealing with our company, and that begins the moment we first pick up the phone. No matter your needs, you can be sure to find all the details easy to access whether through our website or through talking personally to one of our staff. We are proud members of the Cypress area, and aim to bring you a service that you can be proud of as well, which starts from our first point of contact. We would like to again thank you for stopping by our website to find out more information, and we look forward to being able to bring you the highest quality service in the Cypress and Houston area. No matter your needs, we will take every step to ensure that we can provide them to the highest quality standards.